Heat oven to 350°F (325°F for dark or nonstick pan). Line 9-inch square pan with foil, allowing some to hang over edges of pan. Grease bottom and sides of foil with shortening or cooking spray. Make and bake brownies as directed on box. Cool completely on cooling rack, about 1 1/2 hours. Freeze in pan 15 minutes. Using foil to lift, remove brownies from pan, and peel foil away. With deep 3-inch heart-shaped cookie cutter, cut 7 brownies. Save leftover pieces for snacking. In small microwavable bowl, microwave caramels and whipping cream uncovered on High 30 seconds; stir. Continue microwaving in 15 second intervals, until mixture can be stirred smooth. Arrange brownies on serving plate. Drizzle about half of the caramel mixture over brownies. Sprinkle with pecans. Serve with remaining caramel mixture. 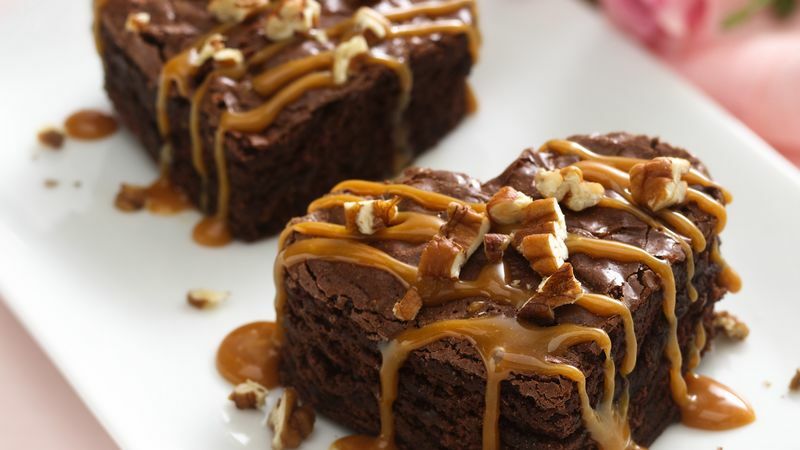 Make double-chocolate brownie hearts by drizzling with chocolate-flavor syrup instead of the caramel.